How does the 2018 Nissan Rogue beat its competitors? The 2018 Toyota Rav4 and the 2018 Ford Escape don’t measure up when it comes to gas mileage, cargo capacity, front headroom and safety features. Purchasing a new vehicle is a big investment, and it pays to do your research up front on comparable cars in the same class. Your friendly experts at Speedcraft Nissan can answer any of your questions, but here’s a quick overview of how the 2018 Nissan Rogue stacks up to its peers. The 2018 Nissan Rogue is aerodynamic and offers better highway fuel efficiency, at 33 MPG, than these competitors: 30 MPG for the 2018 Toyota Rav4, 32 MPG for the 2018 Subaru Forester and 30 MPG for the 2018 Ford Escape. With more room behind the second row than any competitor, the 2018 Nissan Rogue allows drivers the luxury of not having to choose between passengers and cargo, with 39.3 cubic feet of space. The 2018 Toyota Rav4 has 38.4 cubic feet and there’s only 34 cubic feet in the Ford Escape. All three vehicles let you fold the second-row seats flat, but the Rogue’s second row seats can also recline, slide and tilt forward for easy access to the optional third row. The Rogue is also versatile, with 18 different cargo conﬁgurations. The 2018 Rogue offers standard Apple CarPlay™ and Android Auto™ capability as part of its NissanConnect system, giving drivers access to their favorite mobile apps, even while en route. These features are not standard on the Rav4 or Escape. If you’re exceptionally tall, you’ll be more comfortable in the 2018 Nissan Rogue, with 41.6 inches of headroom. The Rav4 has 39.8 inches and the Ford Escape has just a tad more room at 39.9 inches. The 2018 Rogue offers blind spot warning and rear cross traffic alert as standard equipment. Blind spot warning provides a visual cue if there’s a vehicle in one of your blind spots and an audio alert if you turn on your signal while it is active. With rear cross traffic alert, you can reverse out of parking spots knowing it is helping to detect vehicles approaching from either side. On every other competitor in its class, this feature will cost more. Also available is the Intelligent Around View Monitor, which gives drivers a 360-degree image of surroundings from above and provides visual and audible alerts if the system detects something moving near the vehicle. Questions? 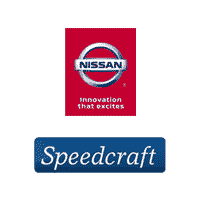 Contact your Speedcraft Nissan expert today.